This recipe is a long time coming, guys. 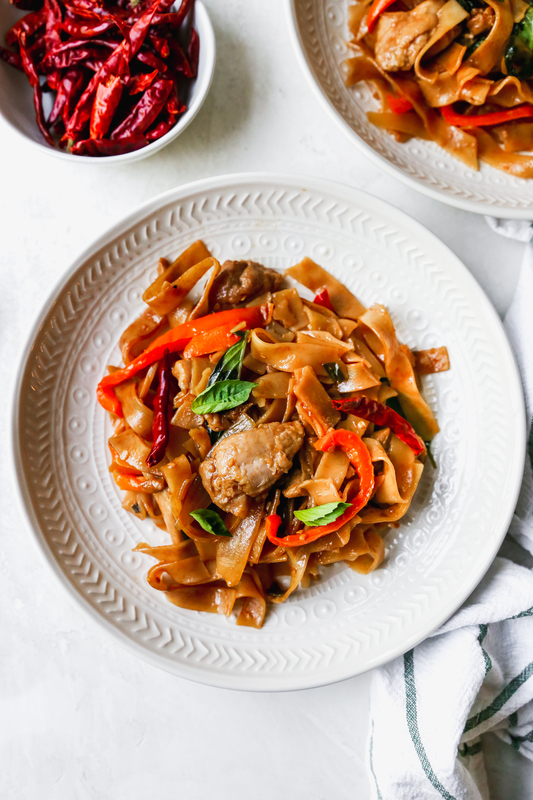 I have been working on perfecting this version of Thai drunken noodles for months. MONTHS! And I think I finally figured it out. I have a longtime love affair with Thai food. It is definitely one of my favorite cuisines, and lucky for me, we have access to some delicious Thai food in Philly. Unfortunately, we don’t always have the time or inclination to drive into the city to get said food. Which led to me taking it upon myself to figure out some of the recipes at home. Thai coconut soup is my absolute fave, and I make it all the time in the winter months. My mother swoons every time she eats it, so I always try to make an extra quart or two for her to take home. It’s simple but oh so good. I have a recipe on my site for Thai coconut soup, but I have since improved that recipe. I hope to share the updated version with you soon! 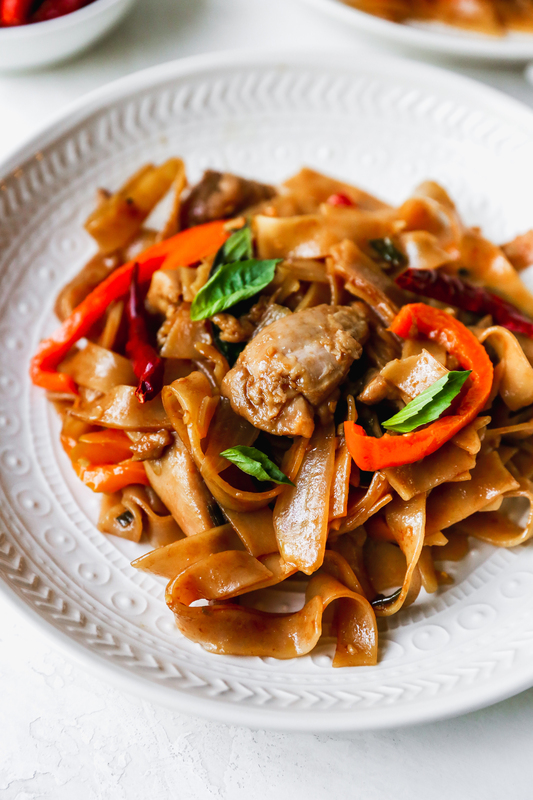 Drunken noodles, my favorite entree to order, were a little bit harder to figure out. 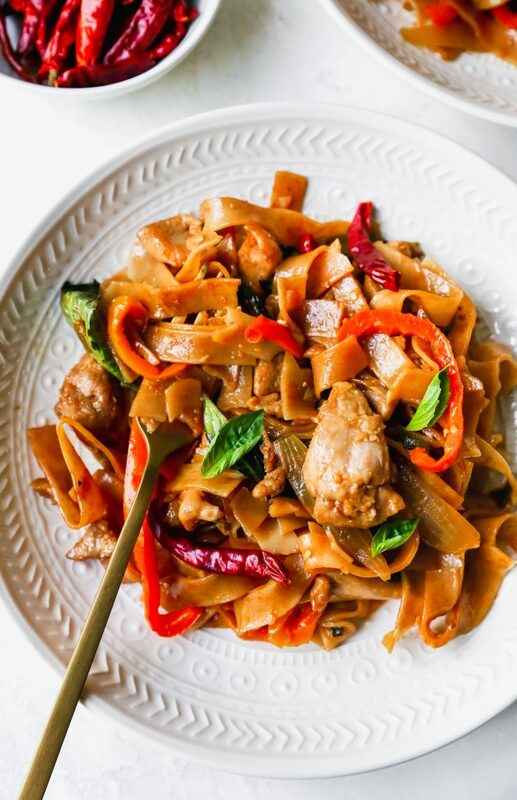 If you’ve ever ordered drunken noodles from an authentic Thai place, then you know how complex and deep and nuanced the flavor can be. It is an addicting mix of savory, salty, sweet, herby, and spicy. And the textures are to die for! It is DELICIOUS. Having such little experience cooking Thai food, I was a bit intimidated to try it at home. I have made this dish, or at least a version of this dish, probably 10 times now? Each time was closer and closer to the flavor I was going for. And THIS version is finally it. Thank the heavens. Both Dan and I have agreed that this is it. This recipe wins. 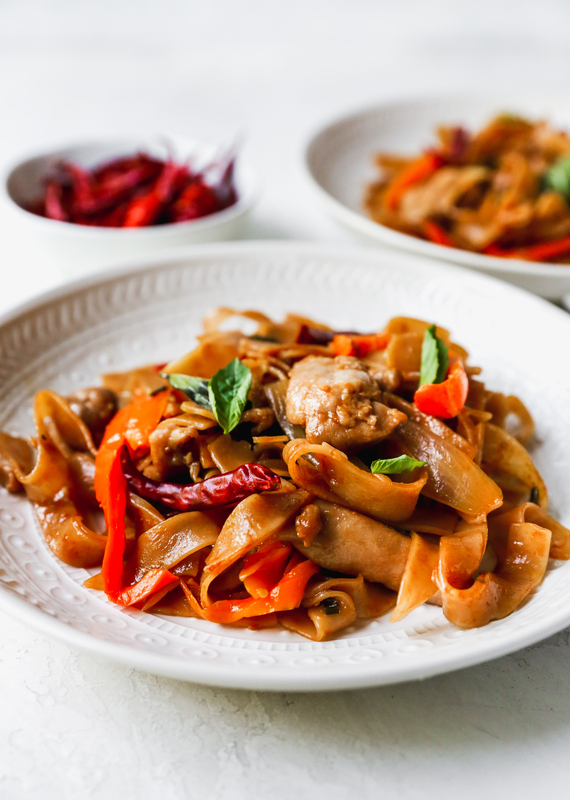 Now, drunken noodles is typically a spicy dish, and when you make it at home, you can completely control the heat level. See my notes in the recipe below for regulating the heat level to your tastes. Because Thai chiles are NO JOKE. They are freaking HOT. With all my testing and tweaking of this recipe, I finally feel like I have a good gauge as to what is needed to get our ideal spice level. 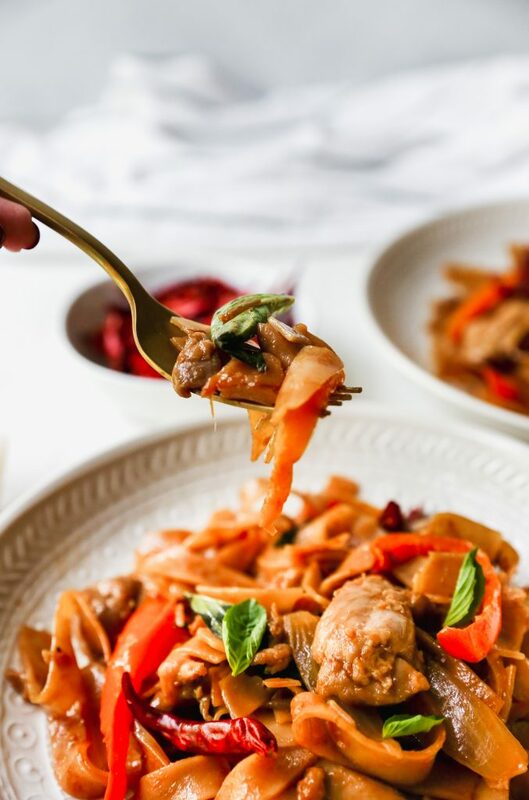 You’ll also notice that there are some ingredients listed in the recipe that you may not have on hand, like dark Thai soy sauce. I was determined to make this as authentic as possible, so I went out and got a bottle at a local Asian grocery store. If you cannot find it or don’t want the extra bottle in your pantry, just sub with regular soy sauce. Same with the Thai basil. While I HIGHLY recommend that you use the real stuff, you can sub with Italian/American basil, if needed. Investing in Asian pantry ingredients, however, is something I recommend. They last forever, as most are potently flavored and a little bit goes a long way. They have a long shelf life. They add an incredible flavor to dishes that you really can’t get elsewhere. I cook Asian food with some regularity, and so to me, it’s totally worth having a few extra bottles in my pantry. What is it about rice noodles that is so spectacular? It’s the texture, right? They’re soft with a little chew, and given their mild flavor, they are the ideal vehicle for flavorful sauces and curries. I love them. These noodles are definitely a point of pride for me. They took a lot of work, testing, re-testing, trips to the specialty store, and tasting to get just right. It was tough. Well, as “tough” as it can be to attempt a delicious dish over and over again. It was super taxing. Hah. Indulge me and indulge yourself by making these as soon as possible. You will NOT be sorry. They taste just like Thai takeout! 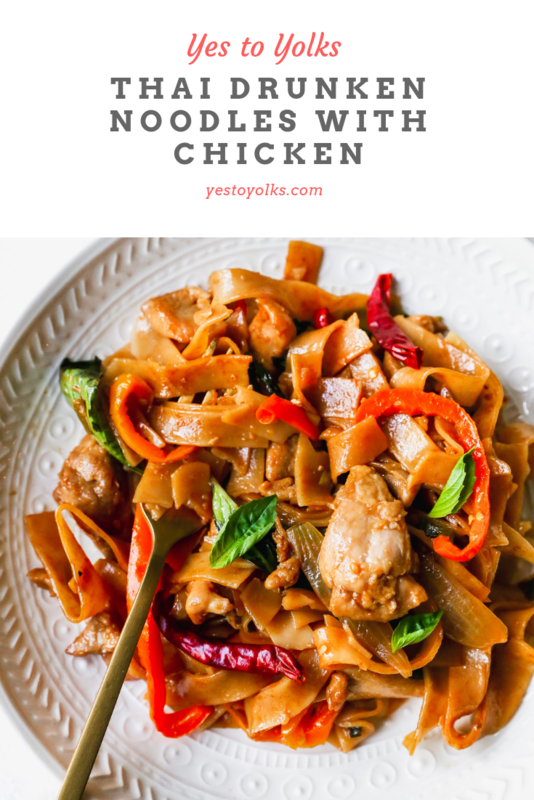 Place the chicken in a large bowl and add the water, soy sauce, and cornstarch. Stir the ingredients together until all the chicken is evenly coated. It will almost look paste-like on the surface of the meat. While the chicken is marinating, soak the noodles in hot water, according to the package directions. Drain and rinse well. Set aside. I recommend prepping all your vegetables so they are ready to go. Stir fries happen fast and you want everything ready when you start. Stir together the dissolved brown sugar/water mixture, soy sauces, fish sauce, and oyster sauce in a small bowl and set aside. Heat your wok until it's close to smoking, and spread 2 tablespoons of oil around the perimeter of the wok. Add the chicken and let it sear for 2 minutes per side until it is mostly cooked through. Remove the chicken and place on a plate. Add another tablespoon of oil to the wok and add the garlic, ginger, and onion. Cook, stirring constantly, for about 30 seconds. Add in the bell peppers, scallions, Thai chiles, and Thai basil. Stir fry for another minute, stirring and shaking the pan as things cook. Add the wine and cook for another few seconds. Add the brown sugar-soy sauce mixture along with the softened rice noodles and chicken. Toss everything together well, and cook until everything is tender and the sauce is evenly coating all the noodles and veggies. Serve immediately. I have made this with both fresh and dried Thai chiles. I find that the dried chiles are HOTTER than the fresh, so if using dried, start out with 2-3 and add more, as needed. In my testing, 4 fresh chiles was the right amount of heat for us, which is quite spicy.